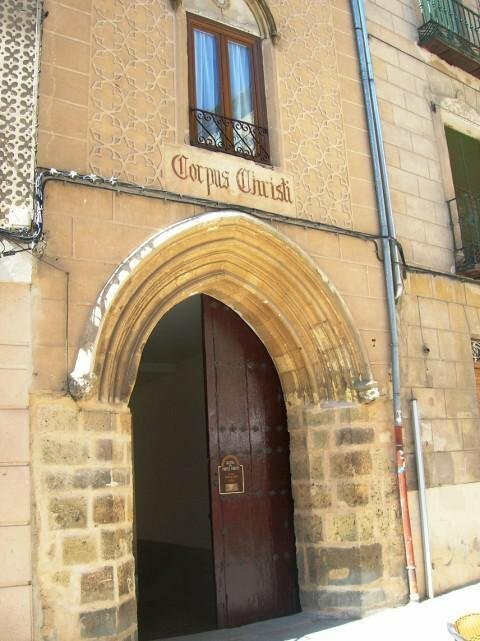 The gateway to Corpus Christi Church is located on Real st. A gothic arch of the XV century allows to enter a patio, to the end of which a door with a horseshoe can be found. In the central part of it, you can see the inscription: "Soli Deo honor et gloria" (Glory to God alone) and in an angle, the date of the first restoration. There is a legend saying that in 1410 the sacristan of the San Facundo Church was in a lot of debt and asked for a loan to a rich Jewish doctor from the city. He accepted on condition that he received in exchange a consecrated Host. The sacristan agreed and the exchange happened one night un a street now called "Malconsejo" (bad advice), to remember this event. The doctor and other Jews got together in the Great Synagogue of Segovia and they decided to throw the consecrated Host in a saucepan of boiling water. But before it brushed the water, the host stayed suspended in the air. Then the synagogue started shaking and a crack opened in a wall where the body of Christ miraculously got out, who crossed the city flying to take refuge in the Monastery of the Holy Cross. When the bishop of Segovia learned about it, he wanted to know how it happened and conducted an investigation. The sacristan immediatly confessed and the doctor was arrested and sentenced to death. The King Juan II confiscated the synagogue and offered to the bishop who dedicated it to Christian worship and had it named the Corpus Christi Church, as an account of what happened there. He let the religious community of the Clares who still occupies it. At the entrance of the Corpus Christi Church, a painting of Vincente Cutanda who has the title "The Eucharistic Miracle" illustrates this event. This church is regarded as a sacred place for the Christian and Jewish religions. It was used as a synagogue until 1410, date upon which it was taken from the Jewish community. Among the five synagogues in the city, this is the one that preserved its original structure best, despite the 1899 voracious fire that destroyed its roofing and its decorative elements. 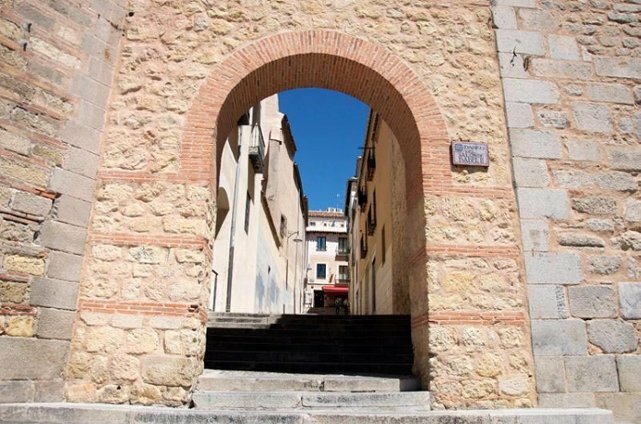 A few meters away from the Corpus Christi Church, the San Andres Gate gives access to the Jewish Quarter. Although there is no documentary evidence of the presence of Jews in the city before 1215, historians claim that such a possibility exists, unless from the late XI century. But it's mostly during the next centuries that the Jewish presence in Segovia will become known, with a stocking density locating it amongst the most important in Castile. 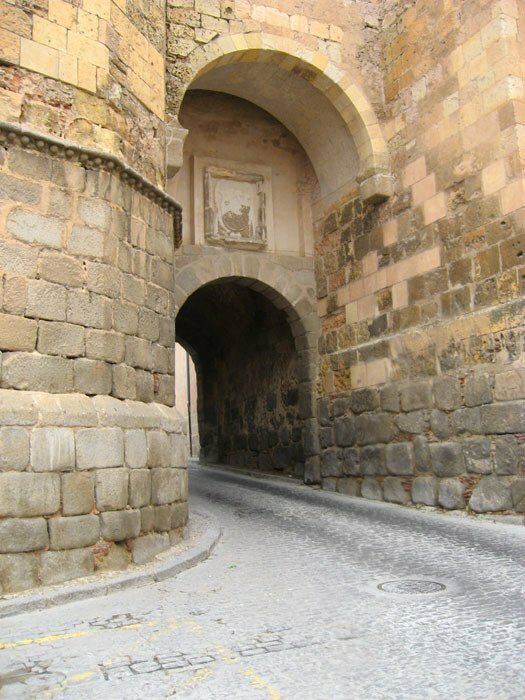 A decisive date in the history of aljama (Jewish quarter) in Segovia is February 2, 1412, year during which not only the Jewish community but also the Muslim community were forced to gather together inside the cities, in closed areas bounded by walls. The Jewish Quarter streched from Almuzara St. north to the city's high wall south, between the ancient slaughterhouse and San Andres Gate. The decree signed by the Catholic Monarchs in 1480 was behind the creation of a true Jewish ghetto, where the population stayed permanently confined until its expulsion in 1492. Indeed, the separation, in 1481, of the Jewish and the Muslims of the rest of the Christian population of Segovia implied the creation of a neighbourhood where the population was four times larger to the one of the last gathering in 1412. It was stretching along the high wall, between the first Great Synagogue and the Church of San Andrés.